Yusuf on the dhow. Photo by Kelly Campbell. 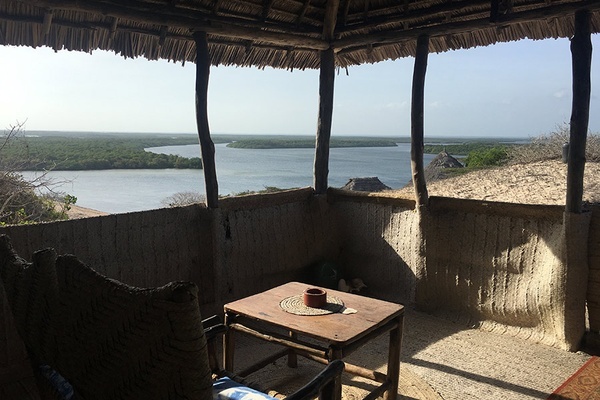 While living in Kenya, Fathom contributor Ariane Marder links up with a fair trade touring outfit for a dreamy sail along the country's northern coast. 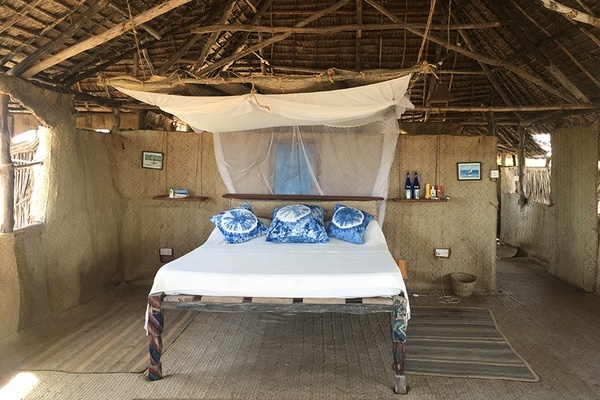 KENYA – Sleeping on a dhow overnight is entirely about trust. Trust that the waves will carry you, the moon will guide you, and the crew that looks after you knows the waters the way you know your lover's face. 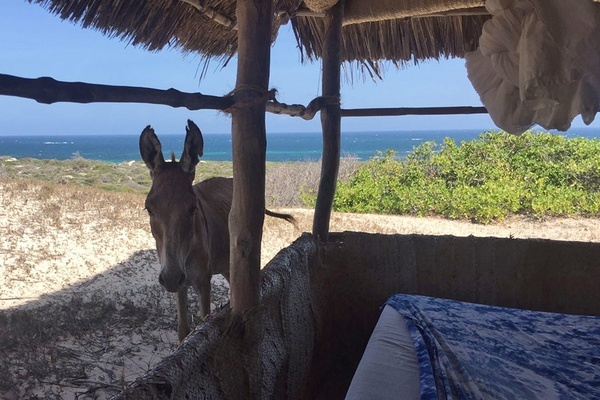 It's midnight when we leave Shela, the tiny donkey-populated island in the Indian Ocean off Kenya's coast, headed north towards Kiwayu. Our crew, six in all including the cook, has meticulously prepared the boat for our sail. 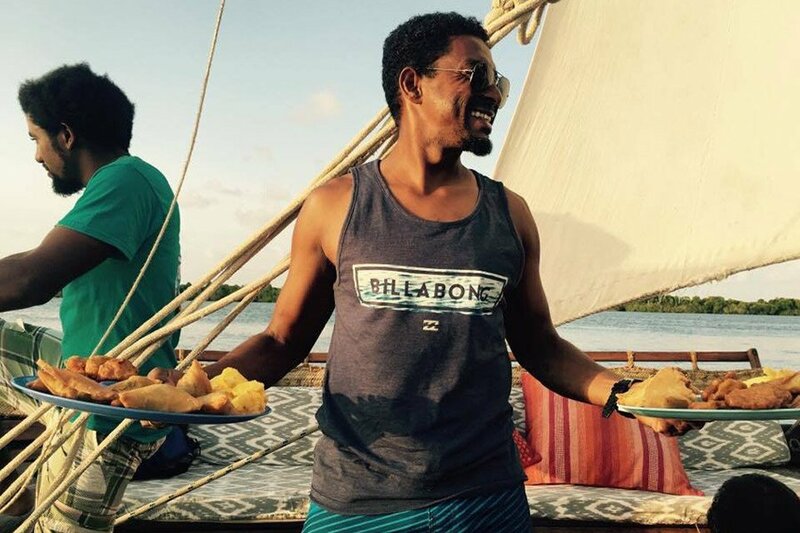 Captain Yusuf Ahmed Ali, a Lamu native and the owner of this magnificent vessel, is dressed for the voyage, swapping his usual kikoy and T-shirt with a mismatched outfit that calls to mind the image of The Royal Tenenbaums crossed with The Life Aquatic with Steve Zissou. The four women, Liz, Jen, Kelly, and myself, settle in on the large cushions strewn across the bow. We wrap ourselves in sarongs and blankets that Kelly, founder of The Village Experience and organizer of this jaunt, has brought with her just in case the salty wind proves a worthy opponent. Andrew, Liz's partner, stays in the back, waiting for a turn at the tiller. Hippo Dhow is one of Shela's best looked-after boats, sporting a sturdy mahogany frame and teak mast, moistened with shark oil to keep the wood conditioned. Yusuf's owned the dhow for ten years, and he beams with pride whenever conversation turns to the handsome ship. He tells the story of how it got its name. "The day we put her in the water, a hippo swam across from the mainland. It must have lost its way. 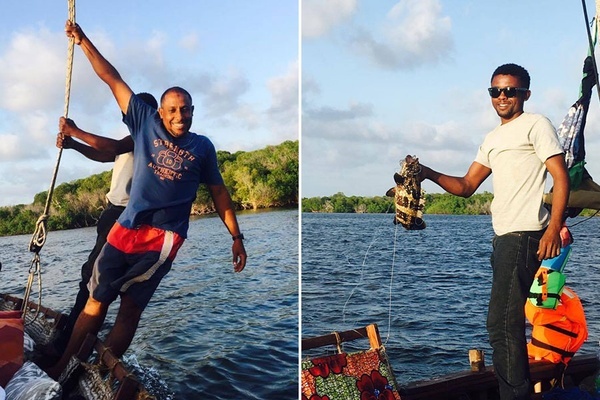 We tried to save it, but Kenya Wildlife Services (KWS) was called in to do away with it. The whole village was treated to the meat." "Perhaps," we tell him thinking of the weak-stomached tourists, "you'd be better off leaving that last part out." Bedroom at Mike's Camp. Photo by Ariane Marder. A visitor at Mike's Camp. Photo by Ariane Marder. The view from Mike's Camp. Photo by Ariane Marder. The sail up the coast through the archipelago to Mike's Camp on the sparsely-inhabited island of Kiwayu takes seven hours. While we cuddle up, the crew — Mamela, Mohammed (Kikebe), Ahmed (Mwarabu), and Yusuf — stay alert, stepping gingerly over our sleeping bodies, tying and untying the mast, navigating the channels, and covering us when the breeze picks up. They've come equipped with solar lights, flashlights, and a jiko (charcoal brazier) for cooking. I sleep deeply, the boat like a cradle rocking me into dreamland. We wake with the sun to a hot breakfast of eggs, samosas, and coffee, substituting our morning showers with a dip in water so clear I can see my chipping toe nail polish beneath me. Andrew innocently jokes about a fresh water rinse. They deliver, pouring a jug over his head on the dock. "You guys think of everything," Andrew says. "Of course. We are cooks, we are sailors, we are fishermen, we are room stewards, and we are waiters." Yusuf responds. Mike's Camp sits at the top of the dunes 1,900 feet up. Everyone I meet from around here says it's their favorite getaway, their best-kept secret. Little do they know, it's also commonly shared. You wouldn't know it by the looks of it. The seven bandas are all but empty when we arrive, save for a couple in from neighboring Kalifi. We climb from the creekside where the dhow is moored up steep sandy steps, the morning sun getting hotter with every minute. Owner Mike Kennedy is at the bar to greet us. He's friendly and apologetic that most of the activity equipment has been broken or damaged. A new sand yacht and motorbike are on their way, but seeing how remote he is, and how it is Africa after all, it could take months. Andrew is nonplussed. He brought his boots along just to take a turn on the bike. The rest of us are perfectly content to snorkel the coral reefs off the deserted seven-mile beach to the east. Back in 1979, KWS declared the adjoining 2,500 miles a national marine reserve, providing a sanctuary for sea turtles, dugong, dolphins, whales, fish, and birds. As a result, the sea is pristine and creatures like fat pink crabs zoom unperturbed back and forth on the shore. Liz, who is four months pregnant, is more interested in retiring to one of the enormous bandas to do nothing but read and sleep. I don't blame her. The views from the rooms are impressive, all looking out on the water, creekside or oceanside, often both. When he built the place, Mike made a promise to respect the sanctity of the surroundings, using eco materials like woven matted palms, which are native to the island. Even the water for the shower arrives by donkey. There are no windows, but those easily spooked in the night can roll down mats over the openings. There is also a makeshift Dutch door to keep the donkeys from barging in. Monkeys, to each guest's delight or chagrin, have free reign. Lazing away the mornings on strategically placed daybeds, reading, and playing ping pong (Mike is killer at the table), it's easy to imagine why anyone would decide to beach here like Mike did once upon a time. The island is teeming with wildlife (cheetah, buffalo, even a lion once in a while will cross during low tide), and it feels like you're as far from civilization as you can get. Our trip home is waylaid by the arrival of KWS in an unofficial pink motorboat. They hold rifles and demand we pay the conservation fees. "To be fair, Swahili, like Italian, often sounds like yelling," Kelly tells us. We struggle to find receipts and pay any outstanding debt immediately. It's all a misunderstanding. Hakuna matata. The crew fishing on the dhow. Photo by Alice Campbell. The author and Kelly. Photo by Ariane Marder. The minute we push off, Andrew grabs the fishing rod, quickly reeling in two grouper and holding them up for photos. In the shallows, between dense mangroves, we sandbank. Mohammed, as the tallest crew member, rolls up his pants, jumps in, and guides the boat through. This is particularly challenging as the moon is still hiding its face. It's also rockier than it was the other night. Water splashes over the dhow, and Ahmed, the crew's knight in shining armor, heads to the front to act as our human shield, taking the brunt of the sea spray. The captain asks us to turn off any lights. It's nearly impossible to make out where the water ends and the shores begin. We could be anywhere. Ali, the cook, prepares our dinner in complete blackness. It's vegetable pasta, and it's shockingly good. Hours into the trip, we pull into a small fishing port. The women have to pee. Lights from other boats come on as one after another we descend the ladder and empty our very full bladders, while the guys sing the alphabet to give us some semblance of privacy. Back on the boat, our sleep, like the waters, is restless. We brace against each other until finally the wind catches the lateen sail and we speed full tilt towards Shela. "I can't promise the sea," Yusuf shouts from the stern. That's okay. We're in the hands of experts, and all we can do is trust. 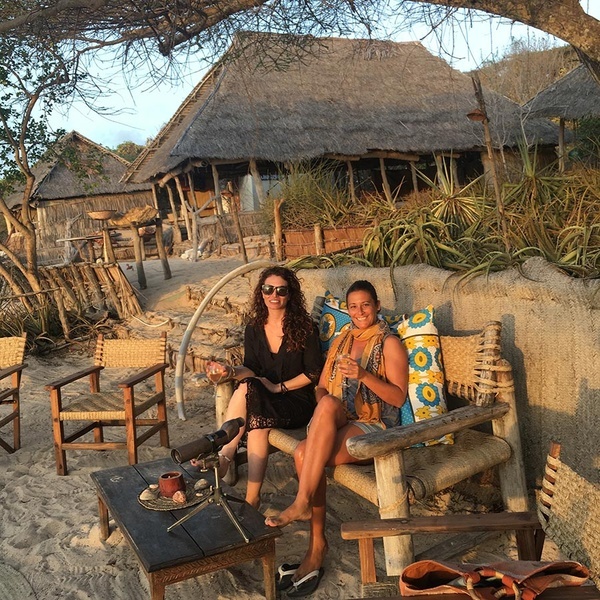 The Village Experience and Hippo Dhow work in partnership with local Lamu charities, such as Safari Doctors and Twashukuru School. Rates are $400 per person for a two-night dhow sail; minimum two people. Mike's Camp runs $150 per person per night, and can be booked through The Village Experience or separately. Snorkeling, fishing, mangrove, and village tours are available upon request. Ariane is a NY-based travel and fashion writer who is addicted to exploring the world. She travels because if she didn’t, she might shrivel up and die. You can follow her on Instagram at @ari_bud.